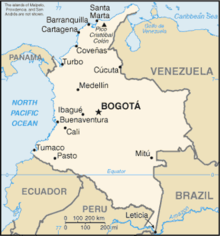 Colombia – tropical equatorial country located in northern South America. It is the most megadiverse country in the world (per square kilometer). The majority of its urban centres are located in the highlands of the Andes mountains, but Colombian territory also encompasses Amazon rainforest, tropical grassland and both Caribbean and Pacific coastlines. Colombia is a middle power, and is the third largest economy in Latin America, and the second largest in South America. ^ "Paisajes naturales de Colombia". Telepolis.com. Archived from the original on 2009-03-20. Retrieved 16 May 2010. ^ "Colombia". The World Factbook. United States Central Intelligence Agency. July 2, 2009. Retrieved July 23, 2009. (in Spanish) Departamento Administrativo Nacional de Estadistica - National Statistics Administrative Dept.